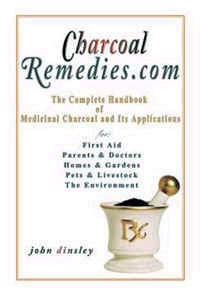 CharcoalRemedies.com:The Complete Handbook of Medicinal Charcoal and Its Applications. CharcoalRemedies.com: The Complete Handbook of Medicinal Charcoal and Its Applications. "If I were stranded on a desert island, and could take only one thing along to protect me from disease, infection, and injury, I would choose charcoal." (2003) - Agatha M. Thrash M.D. A universal first aid antidote for parents and doctors, homes and hospitals, pets and livestock, gardens and farms. This manual tells you when and how to give activated charcoal internally, and when and how to apply it externally for a broad range of health conditions. 6 in. x 9 in. (304 pages). ISBN: 0-9738-4640-2; Gatekeeper Books.